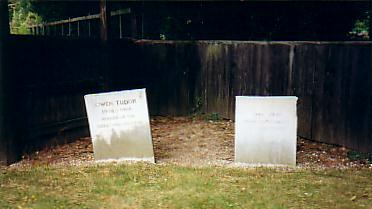 The graves of Owen Tudor (left) and Abernant (right) at Egerton Stud. EGERTON STUD, near Newmarket, Suffolk, England is currently the property of Malcolm Parrish, who purchased the stud from Lady Catherine Macdonald-Buchanan. Heiress of Lord Woolavington (James Buchanan), whose important stud at Lavington became hers in 1935. In 1942, she purchased Egerton House Stud from the 6th Earl of Harewood, which had been the training ground for King Edward VII's horses under the charge of Richard Marsh, including PERSIMMON, DIAMOND JUBILEE, and MINORU. ANMER stood here before his export to Canada. Egerton had also housed the Aga Khan's stallions BAHRAM and MAHMOUD prior to their sales to America in 1940. Lady Macdonald-Buchanan's homebred OWEN TUDOR (1938 by Hyperion - Mary Tudor II) stood here until his death in 1966 (age 28), and here he sired his brilliant sprinting son ABERNANT (1946 out of Rustom Mahal), who also stood here and is buried here. OWEN TUDOR also sired Ascot Godl Cup winner ELPENOR, the outstanding 2,000 Guineas winner *TUDOR MINSTREL, and RIGHT ROYAL V. ABERNANT sired ABERMAID (1,000 Guineas), and EVEN STAR (Irish 1,000 Guineas), WELSH ABBOT, and ABWAH (sire of ABSOLOM), but was more influential as a broodmare sire of the likes of HUMBLE DUTY, CAERGWRLE, DERRING-DO, RICH GIFT, WELSH SAINT, STEEL HEART, and AL HATTAB. -- A.P.